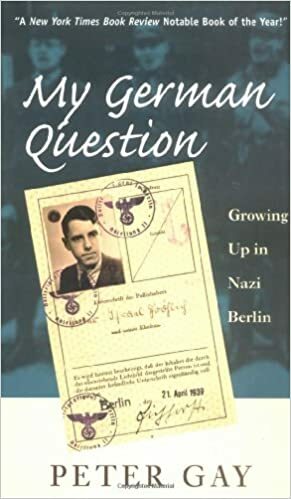 This is an account of the author's experiences as a young, assimilated, anti-religious Jew in Nazi Germany between 1933 and 1939. Gay describes his family, the life they led, and the reasons they did not emigrate sooner. Tante Hede was all business and activity, Onkel Samuel pasty-faced, choleric, and insignificant in family councils. In that couple, Tante Hede, with her formidable energy and need to be in command, was necessarily the leader; her husband, always too heavy and growing more flabby with the years, was no match for her. The story went that in her younger days, when, as photographs show, she approached what one might call stern good looks, she had been in love with a man who was killed in the war.